I am a bit late posting the news, as you can imagine I have been a bit busy as of late. Unreal Engine 4 is now available to anyone who wishes to give it a try for $19 per month. This is very exciting news for everyone at Epic as we are all excited to see what other people do with our tech, and we are looking forward to more users having access to our tools. On top of this a UE4 subscription grants you access to the full source code, which has me especially excited to see what kinds of plugins, features, and tools coders outside of Epic come up with. There have been many people within the studio hard at work for several years now working to make the UE4 experience as smooth as possible. Check out the Unreal Engine Website for more information and learning resources to sink your teeth into. I am personally excited because I have had the opportunity over the last 12 or so months to work on several sample projects in my spare time. Some of them are slated to be released, and you can see them in the marketplace, while others are already available. 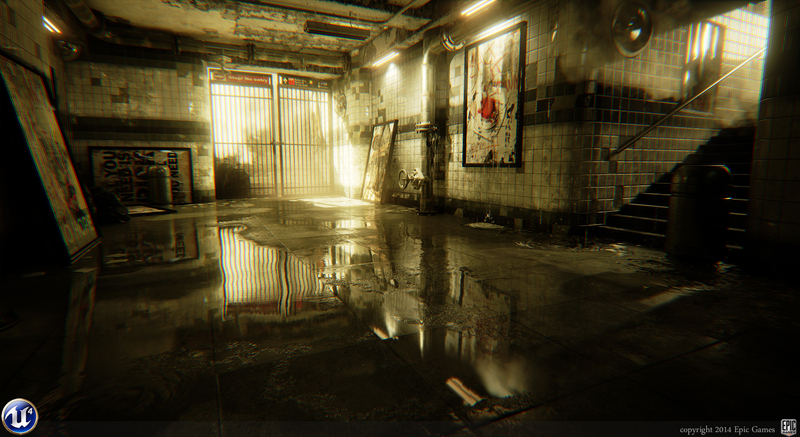 There are a few screenshots Josh Marlow posted from the Reflections demo over on Polycount. I had the opportunity to help Josh and Rick Kohler with some atmosphere FX, as well as several animated puddle decals. Environment work also just happens to be some of my favorite FX work. On top of this news, I was crazy excited to see that Nvidia showcased their newest GPU with this now familiar level modified for a cinematic demo several of us over at Epic worked on. Cinematics artist Michael Clausen was kind enough to lead up a team of artists and animators, and our studio wide Art Director Chris Perna hopped in to give us a new cinematic lighting setup. I had the chance to do quite a few more effects for this, some of them being very subtle water splashes, foot steps, impacts, and all of the wet masks/roughness settings on the characters to get them looking wet. There are also some physics sims when the characters interact with tiles. The video below seems to have already simulated the sequence once, so the tiles are already broken. There is so much more demo content coming, if you were at GDC you may have seen this running in the Epic booth, we had just put in a bunch of extra hours to get the finishing touches on several elements prior to GDC and I was very happy to hear this got some face time on the show floor.